Seasoned chicken, flavorful refried beans and gooey cheese are nestled inside a tortilla and baked until crispy, making them the perfect solution for those busy days. 1. Preheat oven to 425°F. Grease rack fitted on a baking sheet with cooking spray. 1. Heat a large skillet to medium-high. Add ground chicken and saute 5-6 minutes until browned. Add chili powder, cumin, smoked paprika, salt and pepper and saute another 30-60 seconds. Mix half the can of refried beans until incorporated. 1. Lay out tortillas on a flat workspace. Spoon 1-2 tablespoons of remaining refried beans on half of the tortilla and spread around. Next, spoon 1-2 tablespoons of the chicken/refried bean mixture in a line down the middle of the tortilla. Then top with a sprinkle of shredded cheese. 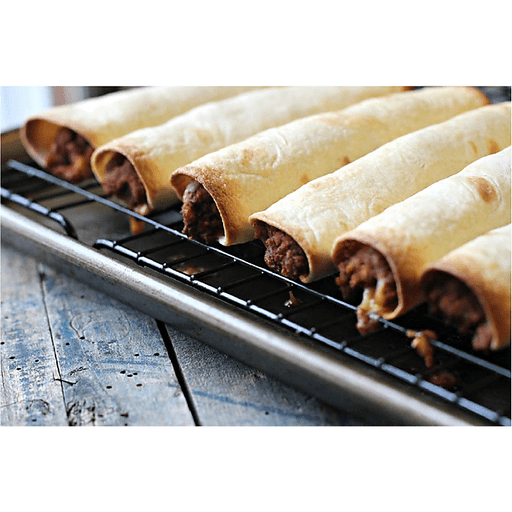 Roll up the tortilla to form the taquito, then place it on the greased rack, seam-side down. Repeat with the remaining ingredients until all of your taquitos are prepared. 1. Mist the tortillas with cooking spray. Bake for 10-12 minutes or until the tortillas are crispy. 1. Remove and serve immediately with toppings of your choice. Top with sour cream, lettuce, tomato, guacamole, avocado and salsa. Serve with Lime Black Bean Fiesta Salad from our deli for an extra veggie punch! Calories 180, Total Fat 5g (Saturated 1.5g, Trans 0g), Cholesterol 40mg, Sodium 340mg, Total Carbohydrate 22g (Dietary Fiber 5g, Sugars 3g), Protein 13g, Vitamin A 10%, Vitamin C 6%, Calcium 6%, Iron 8% *Nutritional values are an approximation. Actual nutritional values may vary due to preparation techniques, variations related to suppliers, regional and seasonal differences, or rounding.